Do you need a tissue for your issue? When our Editor asked us to research facial tissue dispensers, we were a little worried that we would not be able to find adequate information to actually share with our readers. To our surprise, we found many varieties to choose from, and we are here to share with you the Top 10 Tissue Holders/Dispensers for your vehicles. No more fumbling for old crumbly fast food napkins on the floor or folded in to the seat cushions or hidden in your console. No taking your eyes off the road for that dangerous tissue hunt! While reading these reviews, please keep in mind that we considered the fine points of accessibility, appearance, quality, and affordability along with the safety of our drivers in developing this list of our Top 10 Tissue Holders/Dispensers! A tissue for your issue, let’s review! I am embarrassed to admit that I have been driving for over 30 years, and I have never owned a tissue holder/dispenser. I assure you however, that after doing my research today, I am definitely going to be purchasing one from our list below. With so many to choose from, we have narrowed our search to the ones that we believe to be the best. With the variety of holders we reviewed and included in our list, there is surely something for every driver’s needs. These tissue holders and dispensers would also make a great practical gift, the perfect accessory and necessity for those unexpected messy accidents while commuting to work, or taking the family on that awesome road trip. From the easily accessible visor holders, to the convenient cup holder dispensers (which are also great for airport travelers), and a multi-purpose organizational tool for the busy family, you could have a different one for every vehicle! Kicking off our list at number one is Mr. Ho’s Black Leather Multi Use Tissue Dispenser, and it’s easy to see why! If you want to add a little glamor to your vehicle, check out this modern savvy tissue dispenser. Made from beautiful durable leather and lined with a flannel-like cloth and accented with precisely stitched trim, it sure is a beauty! It has a soft decorative look and feel, you will surely be pleased with this dispenser. This product is easy to install by using the elastic strap to attach to your visor, headrest, console or simple place on the dashboard. Wipe with a damp cloth for years of use. Very pretty and will make a classy addition to your vehicle. This is one of the nicest tissue dispensers on the market today and certainly one of our favorites. The leather is soft and durable and undoubtedly looks much more expensive than what it really is. The appearance is classy and can easily be wiped clean with a damp cloth which will give it that new look for years to come. This is a multi-use tissue dispenser and could be placed on the vehicle visor or backrest. This dispenser will prevent your tissue boxes from being tossed around your vehicle or smashed beneath your seats. Easily accessible and predictable and will allow you to keep your eyes on the road as you reach for your tissue. This tissue holder is one of the more expensive ones, but well worth the cost because of the quality and appearance. You’re going to get what you pay for, generally, and in this case, it’s definitely true. This tissue holder is well worth the price. We chose the MEIBEI Leather as our second-choice tissue dispenser. This classy tissue dispenser will be a favorite practical necessity in your vehicle. Made from beautiful litchi grain faux leather with decorative chrome plated accents for smooth dispensing action. Hanging elastic clips make it easy to install on the driver/passenger sun visor or the back seat of your vehicle. We really liked the visual look and it was so very effortless to use. This tissue dispenser is beautiful and looks expensive if you are trying to add class to your vehicle. The chrome plated accents are a wonderful touch and as you step into your vehicle you can’t help but notice just how pretty it is. This visor tissue dispenser is very easy to install and very convenient to use once placed upon the visor. This dispenser can also be placed on the back of either headrest, although for precise ease for the driver, it is recommended to be placed on the back of the passenger’s headrest. This tissue holder is higher priced, and a good reason for it. The appearance and ease and quality of this product make it a great choice. The rapid, simple installation make this tissue holder a favorite. Coming in at number three, we chose this simple yet beautiful Locen tissue dispenser that will compliment any vehicle’s interior. This tissue dispenser can be easily installed via the attached clips. This dispenser is lightweight and is easily accessible for the driver so that they can keep their eyes on the road at all times to avoid accidents. Very simple yet pretty. It is made from durable leather-like material that gives it a nice visual look. This design is neutral and will work well with all interior. This is a much-needed accessory to any vehicle. 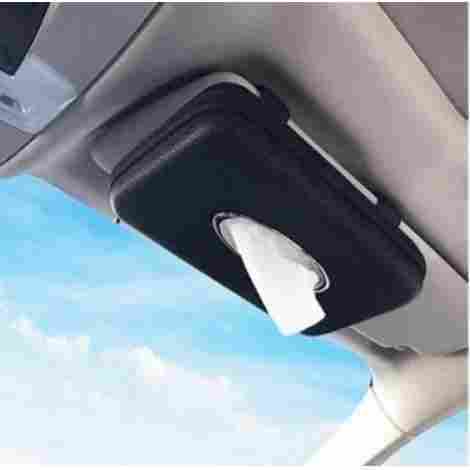 This tissue dispenser installs easily with a simple U-clip that can always be attached to the driver’s or passenger’s sun visor for easy access to keep your eyes on the road and be safe. Cost is midline, not too expensive and not the cheapest. If you are looking for a simple tissue holder that looks nice, this is the one! On to our fourth pick: We added this product to our list because it gives you, the reader, a slightly different option when it comes to multi-use tissue dispensers with an added organizational benefit. This organizer boasts an effortless way to keep everything in one place and therefore making it easy to keep your vehicle clean and organized. Standard tissue is placed on the bottom to give it a nicely structured base. This is a nice practical bag with a simple tissue dispenser, that keeps your vehicle looking clean and put together. Included are a few pockets for drinks, sunglasses or whatever you choose. The trash can uses a hook-and-loop closure to keep garbage where it belongs (out of sight), and not all over your vehicle’s floor. This tissue organizer has adjustable hook-and-loop straps for quick and simple installation. If the driver needs this to be easily accessible from his/her seat, we recommend placing it on the back of the passenger’s headrest. The cost of this hanging tissue dispenser/trash holder/organizational bag is a deal considering the many purposes it serves. This is a wonderful little bag with many extras and would be a great asset to keep items in their place. Settling in nicely at number five is a sturdy leather-like tissue dispenser. It is simple yet practical and will certainly keep all your tissues in one place instead of all over the floor of your vehicle. This sleek lightweight design makes it multifunctional and can be clipped on to the sun visor, the back pocket of your seat or can be placed in the door pocket of most vehicles. This leather-like tissue dispenser is durable and matches well with any interior. It’s a nice little holder that will certainly keep your tissues all in one place and ready for use. It is small and discreet and clips nicely on to your sun visor and does not interfere with most vanity mirrors. This would be a nice accessory to any vehicle. Strong clips allow a nice tight fit to the visor and will not drop or obscure your view. If placed in the backseat pocket or side door panel it will certainly be less than an arm’s length away. No need to take your eyes off the road when using this great little tissue holder with multifunctional placement. This is not the cheapest option when choosing a tissue holder for your vehicle, however, the value it holds, and the multifunctional placement options makes it a quality choice and cost-efficient. When you need a tissue, you need a tissue, and saving a few cents is not the first thing on your mind! Entering at number six is the Shakar Multifunctional Tissue Dispenser. This high-quality dispenser is made of leather-like material that is smooth and soft to the touch. Its sleek design looks classy and would be a wonderful accessory to the personality Type A driver who doesn’t want the tissue clutter on seats and floors. 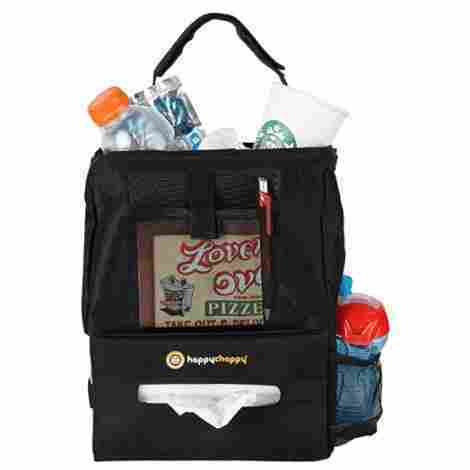 This has a zipper closure and sturdy straps to keep the product in place on visor or back headrest. This is a plus-size dispenser and holds a standard box of tissue which is a must for avid drivers and families who consume large amounts of tissue. This beautiful black plus-size tissue dispenser is certain to add class to any vehicle. Featuring luxurious leather-like material that is soft to the touch and easily washable with a damp cloth to keep it looking brand new for years, it will keep the front seats non-cluttered with ample room for the driver. In this modern, high-speed era, we're always hitting a drive-thru, and front seat space is at a constant premium. This model will help you help yourself. Easily accessible in order to keep drivers focused on the road. Multifunctional and can be placed on the dashboard, sun visor, or center console. This is a nice-looking tissue dispenser and well-crafted with smooth leather-like material. Durable zipper with sturdy straps keeps this product secured. The price is on point, and a good choice for consumers. Lucky number seven in our list is the ATB Leather-like Visor. 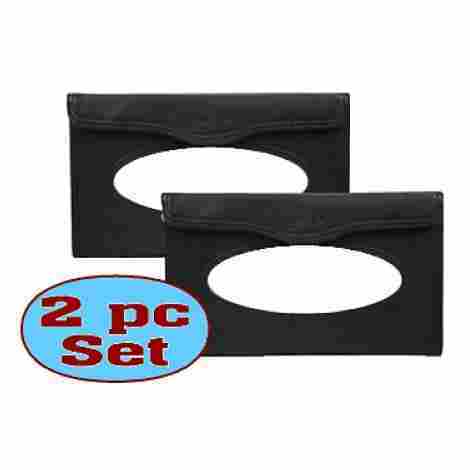 This super quality, black leather-like tissue dispenser comes in a generous two pack. This tissue sun visor placement will always keep your tissue at your fingertips to ensure that your eyes remain on the road while keeping you safe. Tissues are easily ready and predictable for you in preparation of those unexpected cleanups. Holds full size tissues for full size families and is very functional and clips tightly to your sun visor. This is a simple design, yet practical. This is a sturdy black leather-like dispenser with attached clips that tightly secure to your visor. This dispenser will keep your tissue nice and neat while keeping your vehicle clean and tidy. 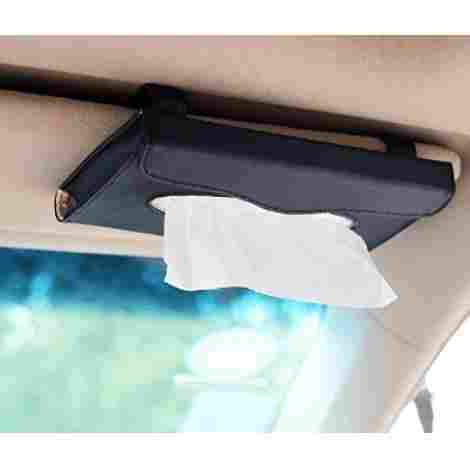 This ATB Visor Tissue dispenser attaches above your head on to the sun visor. The attached durable clips secure tightly, and the vanity mirror will not be obscured on most vehicles. No clutter at your feet, and no seats to reach around to access your tissue. This product is lower priced, however, receiving two dispensers for the price of one surely makes this a great value. A solid choice when money is factored in at decision time. Buy two sets and put them in your vehicles and your kid's too! Coming in at number 8, we included this great full-size tissue box holder in our list, to give you another alternative to the smaller holders/dispensers that are listed above. This is a nice quality plastic holder that fits on the “hump” of most vehicles. No more losing your clunky box of tissue on the floor when turning corners when you have this creative redesigned “old school” tissue holder. Remember years ago, when tissue holders used to be packaged with a bean bag bottom? If not, consider yourself young. 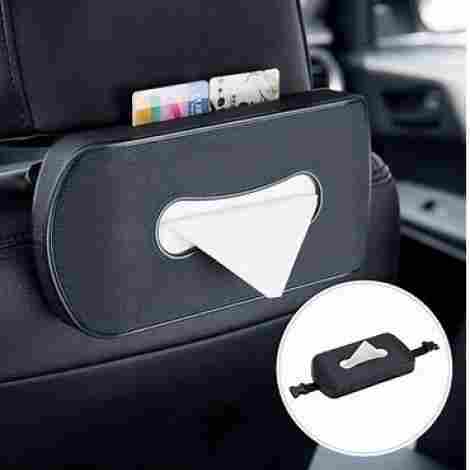 If so, you’ll note that this nifty tissue holder has a new look, with adjustable legs to be customized to the perfect size fit in your vehicle. This is a nice full-size tissue holder that holds most standard boxes of tissue. It fits securely in the backseat on the “hump” of your vehicle, making the front seat completely clutter free. This is a nice simple product that will allow your tissue to stay in one place and not be scattered and crushed as passengers enter and exit your vehicle. This tissue box holder sits directly between the driver and passenger on the backseat hump behind the center console. This product fits most all rear drive and all-wheel-drive vehicles. Easy access and within arm’s length of both driver and passenger. Some vehicles lack a gap between the from seats, and this model may not be suitable in that application. No more crushed boxes of tissues on the floor. This is a simple concept tissue holder that keeps your standard tissue box safe and clean. Midline and priced accurately. It is a great value simply because it is as simple as it is. We love products that are simple and intuitive, and this one is a prime example. May no fit in all vehicles. Coming it at number nine coincidently comes in a 9 pack! 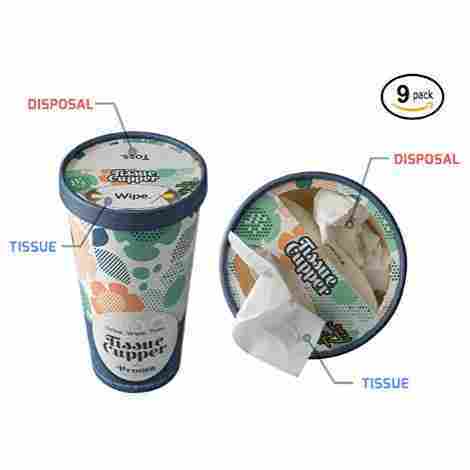 What a great way to dispense and dispose of tissue all in one small cylinder dispenser. Because they are “toss and go”, they come in a 9 pack for easy ordering and convenience. This tissue dispenser fits perfectly in your center console or in the side door pocket. It can also be carried in your bags and suitcases for easy travel and keeping germs where they belong - contained! This tissue dispenser/disposal comes in 3 assorted designs, similar to what you would find on a standard box of tissue. Perfect for the vehicle, home or office! Pop it in a cup holder and it is instantly integrated into your decor. The cylinder design makes it perfect to be placed at arm’s reach in the center console cup holder, or the inside car door pocket. The combined disposal makes it nice, so you are not fussing around, looking for a garbage bag or tossing it on the floor. Everything stays neat in this great little 2 in 1 container! It is a little more expensive than some of the above mentioned, but the buyer is paying for convenience along with the toss and go feature of 9 individual containers. Last but certainly not least, our number 10 pick: This is a great little product, both simple and practical. This dispenser is small and lightweight and holds travel size tissue perfectly. It has an open and close snap mechanism for easy refill. 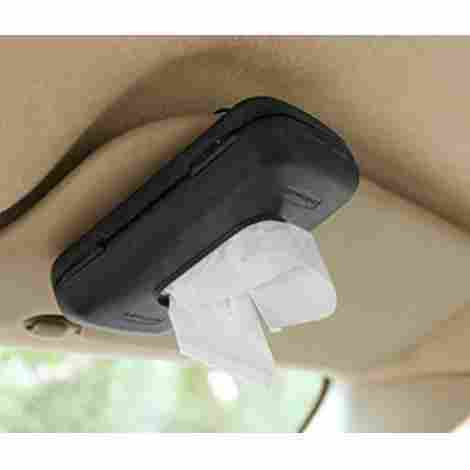 This dispenser can be attached to your sun visor for convenient access and does not block your vanity mirror. This product can be cleaned with a damp cloth. If you are looking for a simple cost-efficient travel size dispenser for your vehicle, this is the one! This tissue dispenser is small and practical. It is made by Rubbermaid and is a trusted, familiar brand to most which are why we are including it in our top ten list. It is black in color and will match all vehicle interiors. Really, when you think about it, black matches almost everything. And have you seen the interior of your teen driver's vehicle lately? Let's just say matching colors is the least of your worries there. This lightweight dispenser clips nicely on the above sun visor. These tissues are accessible with ease and the to will not need to be looking down to reach on the floormats to find a tissue, keeping your eyes on the road always. If you are looking for an inexpensive option to contain your travel tissue, this product is exactly what you need. Simple and practical and the price is on point for a small travel size tissue holder. Below, we will be looking at the criteria we used to determine our Top 10 Automotive Tissue Holder/Dispensers and why the above qualified as the best. Millions of people use trillions of tissues for many reasons in their day to day lives. They are as common as the air that we breathe and the germs that we spread. Helping our viewers remain healthy, and safe while driving is our priority. Here are the most important criteria that we used to successfully determine our list. Accessibility was most important to us, as driver’s safety is number one in our book. Keeping their eyes on the road when they need a tissue quickly is pertinent. These products above are all within an arm’s length away but in most cases, even closer. The visor tissue dispensers are lightweight, and the tissue is literally right above your head. Being constructed of lightweight material prevents the visor from falling, and in most cases does not obscure the vanity mirror. Backrest holders are excellent as well and keep your front seat less cluttered. 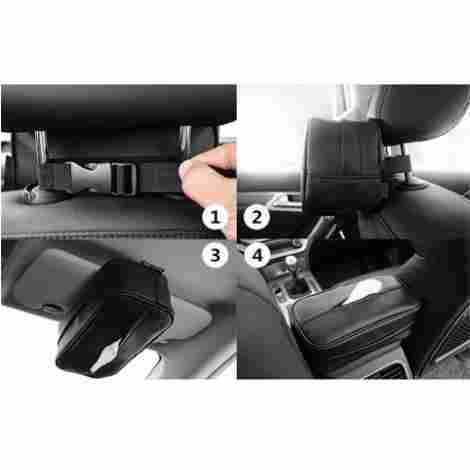 Drivers may want to place these types of holders behind the back-passenger headrest, making it effortless for most drivers to reach. These dispensers can easily be rotated into a forward position in the passenger seat if drivers are without a passenger. 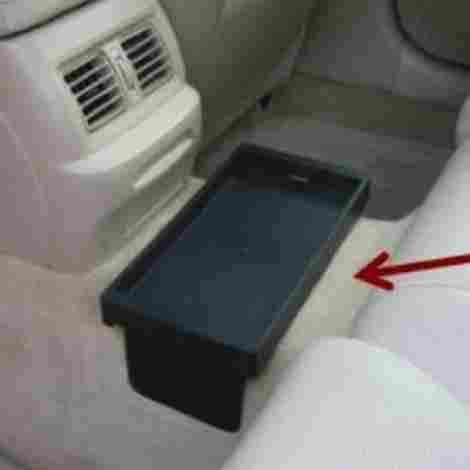 We really liked the console holder options as well, no searching for the lost box of tissue beneath the seats and has a readymade trash holder attached. Whichever you choose, and wherever you put it, you will only reduce your frustration and increase your margin of safety as you drive. In the modern world of traffic jams and construction back-ups, every little bit helps! Appearance was an easy one for us as some of the higher end tissue holders/dispensers were all around visually classy (considering their purpose). We really enjoyed viewing all our contenders in this category. All ten of them were neutral in color, most of them in black and went well with all vehicle interiors. The most important visual bonus to these tissue holders was not what you could see, but more what you could not see. No crushed boxes at the bottom of your vehicle floor, no folded restaurant napkins stuffed between seats and on your dashboard. Visually, they are all nice to see and keeps the driver seated in a non-cluttered, safe vehicle. You fasten your seat belt every time you get in, don’t you? Get a well-made tissue holder which will accent your vehicle’s interior while providing that much more convenience and utility. The quality criteria were a little more challenging because most of these holders/dispensers are manufactured with a few different materials only. Our best of the best, of course, leather. We really liked the smooth touch and the quality precise stitching which makes it a classy choice and beautiful accent to any vehicle. The leather-like materials used in the middle of our list are still very nice and well made, and more cost efficient for the consumer on a budget. Regardless of the materials used on our above list, craftsmanship was shown to be excellent. These dispensers are well made, easy to clean and easy to install. All will provide years of trouble-free service. When reviewing our products for our list, versatility was also an important factor in making our final decision. Just as no one driver is alike, neither are their daily needs while commuting. Everyone has their unique preferences as to where they would like their tissue holders and dispensers placed. A model that can be placed in a variety of locations in your vehicle gives maximum flexibility in adapting the placement to your specific wishes. We tended to rate a vehicle tissue holder that is versatile higher on our list. The purpose of buying vehicle tissue holders or dispenser is to keep your vehicle clean and tidy. It follows that we rated products that could be easily cleaned higher on our list. While cleaning your vehicle, all our above products can be wiped with a warm damp cloth and if deemed necessary, a germicidal solution. Always check cleaning instructions before proceeding. A clean vehicle is a happy one! Let’s face it, consumers find it difficult to spend money on items that do not give some sort of enjoyment or instant gratification. The tissue holder/dispenser is a prime example. A vehicle tissue holder is the embodiment of instant gratification. It can be filled (some come prefilled) and in place, ready for use, within seconds of you receiving it! And if it comes at a great price, we rated it higher on our list. Finally, we took all these factors into account when making our judgments. You might think that such a simple product is easily compared, but there are significant differences among them, and finding the perfect balance of all these factors was a challenge. We rose to the task, consumed many cups of coffee, and the final list above is, we feel, what each of you would decide if you took the necessary time to compare each, point by point. That’s why we are here, to help you sort it all out and make the best decision! Finally, let’s look at some frequently asked questions about that new essential in your automotive life, the vehicle tissue holder. How much can you ask about such a simple device? You will be surprised. When you consider all the variations we’ve explored above, there are many questions that come to mind when thinking about tissue holders. We will run through some of them below. Q: How many tissues fit in a holder? A: The short answer is… it depends. Some of them take a standard-sized box of tissues, and will, therefore, hold as many as that standard box you buy at any store to put in it. Some take the travel-sized packs which hold fewer. Some, like the cupholder-sized dispenser above, are disposable so you get what you get. If you want a lot of tissues with you (like when you’re driving the kindergarten carpool!) you might want one of the larger models. If you are a road warrior taking long solo trips, you may be ok with a smaller version. On the plus side, you can buy whatever meets your needs! Q: Do they come in colors to match my vehicle? A: The products we reviewed mostly come in black, so if your interior is black, yes. However, black is usually a universal match to most any neutral interior color. Seems like most interiors are black or gray these days, so there is a good color match. Some come in beige, for a nice blend with the lighter vehicle interiors. If color is important to you, there is one out there for you. Q: Do you need tools to install a tissue holder? A: No tools are required for any of the tissue holders we reviewed. Not a screwdriver, not a hammer, not even a pair of pliers. Most are held in place by either elastic or hook-and-loop straps, while the clever disposable version simply drops in the cupholder. Once you’ve purchased one, you’ll have it installed in seconds, ready to dispense a tissue at a moment’s notice. And that’s exactly what we wanted, right? Q: Can I clean it when I clean the rest of the interior? A: Yes! You can usually wipe them with a warm damp cloth to remove any fingerprints or other possibly unpleasant contaminants from their surface. You might consider using a germicidal product just in case. But these tissue holders are easily cleanable and should wear well over a long period of time. Q: Are these tissue holders one-size-fits-all, or do I need a different size for my Mini versus my Hummer? A: These tissue holders are a universal fit. You may want to select one that holds a travel-sized pack for your subcompact vehicle, but when you get the whole family in the van, you’ll probably want a larger one. There’s nothing worse than running out of tissues halfway across North Dakota! Regardless, any holder will fit in any vehicle.